Craving for something sweet and delicious? 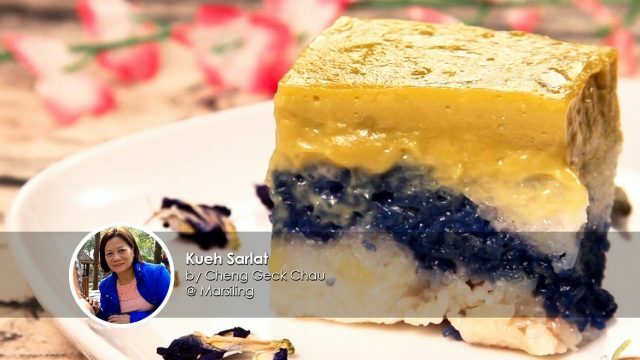 This week, home cook Geck Chau shares with us her Kueh Sarlat recipe! Making this dessert will require some patience as the whole preparation process can be quite tedious. 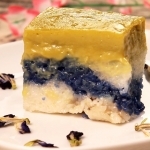 However, don't be deterred from giving this recipe a shot as the delightful and aromatic fragrance you get from each bite will surely make all the effort worthwhile. In a saucepan, boil 200ml water. Add in blue pea flowers and allow it to simmer for 5 mins with lid on. Turn off the flame, let it steep for 15 mins. Let cool. 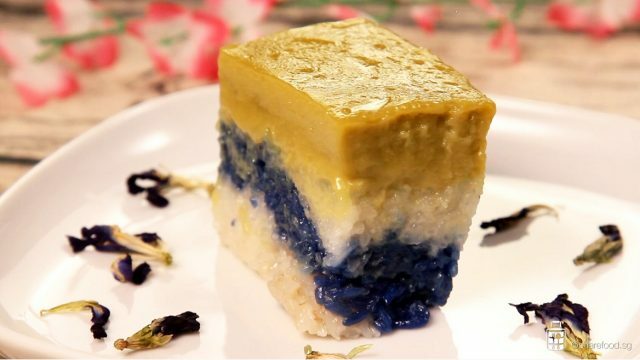 Rinse the glutinous rice to remove impurities until water is clear. Separate the glutinous rice into 1/3 and 2/3 portion. In the bowl with 2/3 portion, pour in water till the rice is fully submerged. In another bowl with 1/3 portion, pour in the blue pea water until the rice is fully submerged too. Let it soak overnight. Drain the soaked glutinous rice. Crush the pandan leaves slightly and stuff them between the rice grains. Add salt to fresh coconut milk, mix well. Divide the coconut milk into 1/3 and 2/3 portions. Mix the 2/3 portion coconut into the white rice and 1/3 portion to the blue rice. Stir and mix well. Steam the rice with high heat for 20 mins. Add the pandan leaf and water in a food chopper. Drain and squeeze the pandan juice using the cheesecloth. Set aside 100ml of pandan juice. In a bowl, add in eggs and sugar. Use a hand whisk to break the eggs gently. Pour in coconut milk, 100ml pandan juice, corn flour and plain flour. Whisk till it becomes a smooth consistency. Set aside. Grease the 7” baking tin. Portion the glutinous rice and place them in the tin. Press and compact it. Step 5: Thicken the kaya batter, pour it on the rice and steam to set. Strain the kaya batter into a metal bowl. Use Bain Marie method, stir the kaya batter continuously until it thickens. Pour the thickened mixture over the rice layer in the square tin and steam it on low flame for 30 mins, until the custard layer sets. Leave the kueh to cool overnight or at least 8 hours before serving.